After a fertilizer application, hungry crops must wait for nutrient mineralization to occur before the applied nutrients are available to use. To speed up and enhance this process, growers can utilize Extract PBA as a nutrient release tool to improve nutrient availability and uptake. As seen in this winter wheat trial, the result is noticeably better plant performance when compared to plants grown on untreated acres. 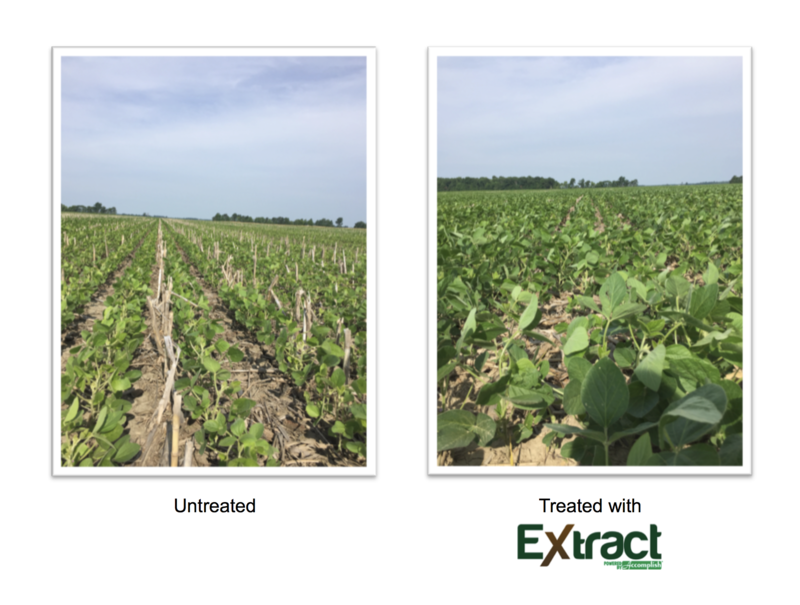 The trial, which was conducted in heavily manured fields in Ohio, looked at the effect of adding 1 gallon per acre of Extract PBA to a grower's existing fertilizer program of 28% UAN. Wheat plants in the untreated plot were planted on October 24, 2016, while plants in the Extract-treated plot were planted a month later, on November 25, 2016. Photos were taken in April 2017. Cover crops provide many benefits that can improve the health of soil, water, and the following crop. However, they can also pose some drawbacks. In the spring at planting, cover crop skeletons can interfere with seed to soil contact. They can also stress the seedling by interfering with access to sunlight, requiring the planted crop to stretch so that it can reach above the cover crop canopy. 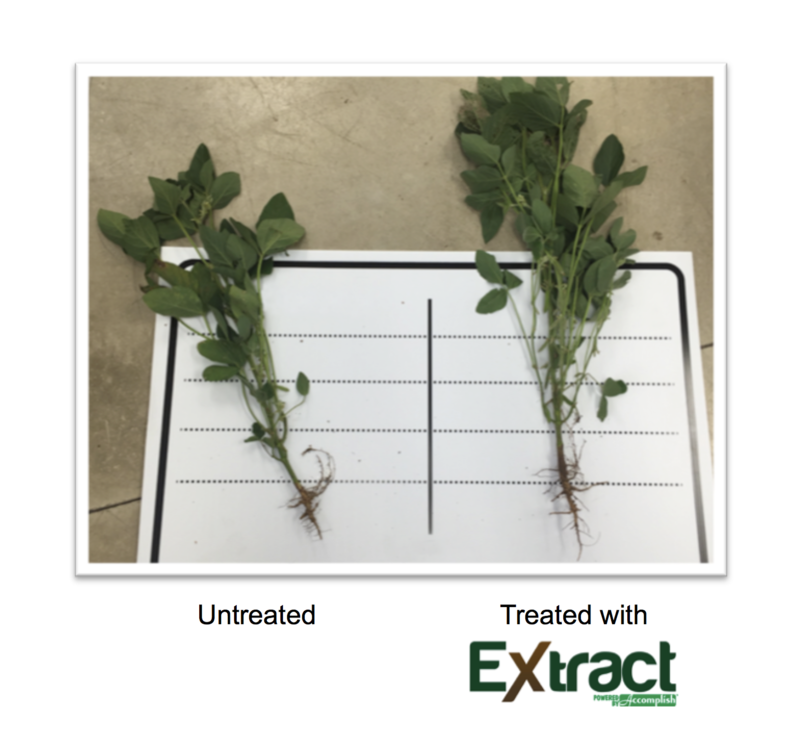 Extract PBA provides an efficient way to manage cover crop skeletons so that growers can avoid these issues and also give the coming crop a nutritional boost. Some recent Nutrien Ag Solutions trials conducted in Ohio show how an application of Extract PBA can break down cover crop skeletons to release nutrients for the following crop. 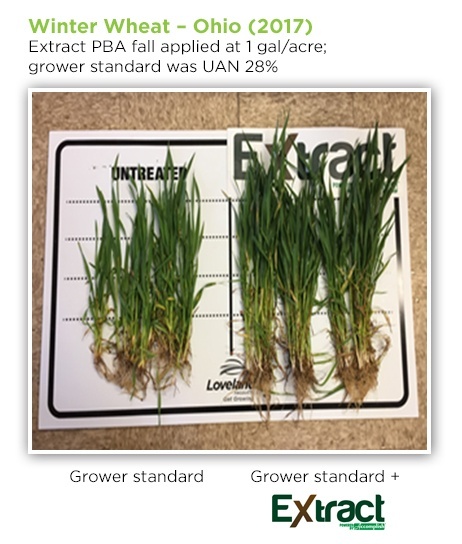 In the top pictures, Extract PBA was applied in the fall at 1 gallon per acre. In the spring prior to emergence, the treated part of the field had better planting conditions and more available nutrients compared to the untreated part of the field, which translated into healthier soybean plants during the growing season. In the fall of 2015 and spring of 2016, Crop Production Services (CPS) locations in Northern Ohio conducted trials to evaluate the benefits of making a fall residue or spring pre-emerge application of Extract PBA (1 gallon per acre) on corn stalks in fields where soybeans would be planted as the next crop. The data shows great potential for a growers' return on investment, with healthier plants and higher pod counts when Extract PBA was used. In the trial results shown below, the plants from the treated areas have a more robust structure to support higher yields. Pod clusters are also tighter, with more per node compared to plants from untreated strips in the test plots. 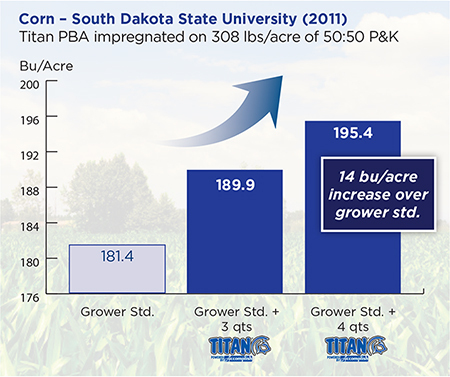 It’s Fall Fertilizer Season: Is Titan PBA in Your Blend? It’s fall fertilizer season, and many tons of dry fertilizer going out to the field from CPS locations will include the fertilizer biocatalyst Titan PBA. Growers who use Titan PBA with their phosphorus (P) and potassium (K) fertilizers in the fall get excellent fertilizer efficiency and great results, as these corn and wheat studies show. 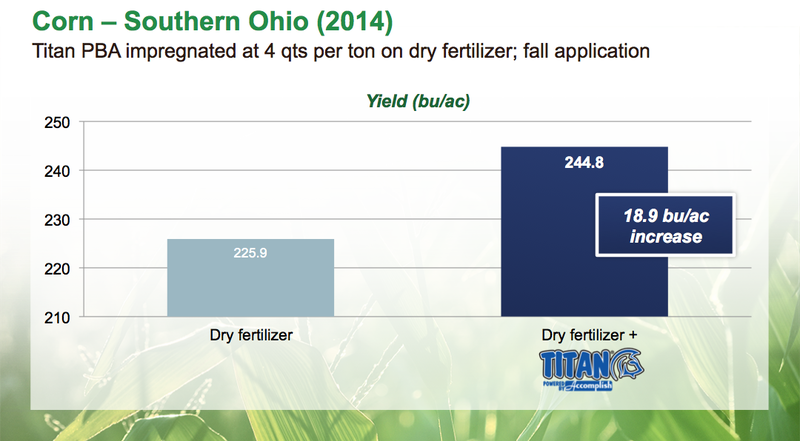 Don’t forget the Titan PBA in your dry fertilizer blend this season! Our partners at Crop Production Services work to get Titan PBA applied to the dry fertilizer that they spread, and for good reason: Titan PBA makes good fertilizers even better. Take a look at the yields from these soybean and corn field trials from 2013. This soybean trial, conducted in Central Iowa, showed an 11.1 bushel per acre increase when Titan PBA was added to the grower’s standard P & K blend.